It almost didn’t happen because of the 12″ of snow Mother Nature bestowed upon us, but this was the first year that a few friends and I celebrated Chinese New Year. It meant a lot to us to try something new! Of course, Chinese food is always best from a restaurant (at least at my house it is! ), and we had plenty of it! One of the most exciting components of this luncheon table was the red and gold brocade table linen. Why? Because I made it!!! While nothing like the highly skilled sewing talents of many of my blogger friends, this was my very first attempt at sewing under the tutelage of my (exceedingly patient!) friend and neighbor, Barbara. Like many women my age, I took sewing in “Home Ec” class back in high school. I got a big fat D in that class. It took an entire semester for me to make an apron that wasn’t fit for use. It was the only D grade I ever got, and I frankly did not care. The class was a nightmare, and I just wanted out. Recently, though, my sadistic niece who has an undergrad degree in Fashion Design & Product Development gave me a sewing machine. After me watching it and it watching me for about 2 months, I finally decided to give it a try. I’m glad I did! My original thought was to use a beautiful fabric set given to me by dear friends from Shanghai. After much consideration, however, I decided that set is best suited for a summer gathering with its more muted tones. This Chinese New Year celebration called for lots of red and gold which respectively symbolizes happiness and wealth. Black seemed the perfect neutral to best show off those two bold and brilliant colors. 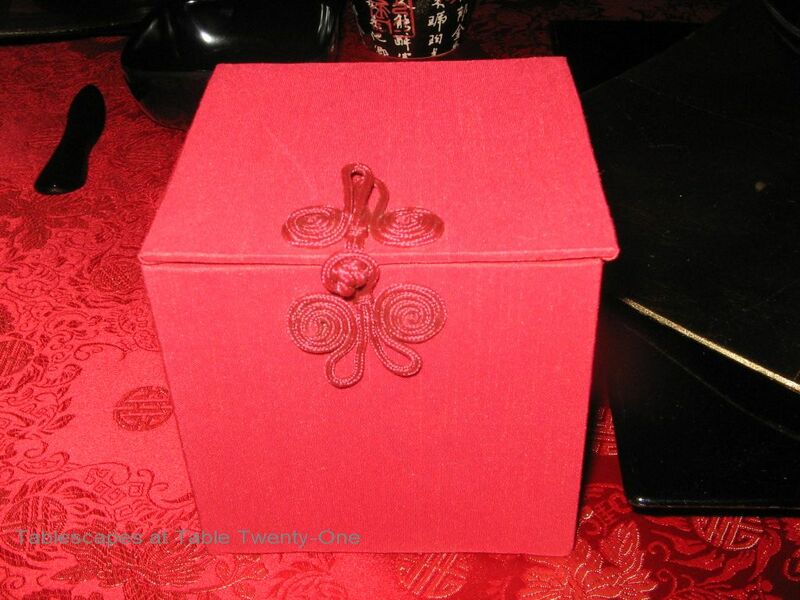 I bought these cool red favor boxes for each place setting at Pier 1 at the end of the 2010 Christmas season. They worked perfectly with this theme! 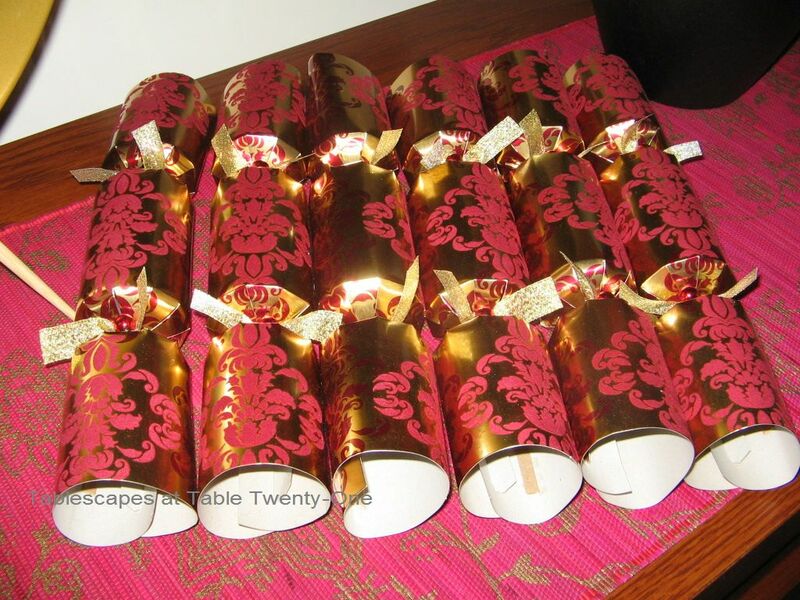 Guests opened the box to find red & gold foil-covered chocolate coins. This 24″H black ceramic ginger jar from Home Goods – adorned with a shimmery gold tassel – makes a simple but stately centerpiece. The buffet is topped with a Pier 1 red, fuchsia and gold bamboo runner to tie all of the separate elements together. 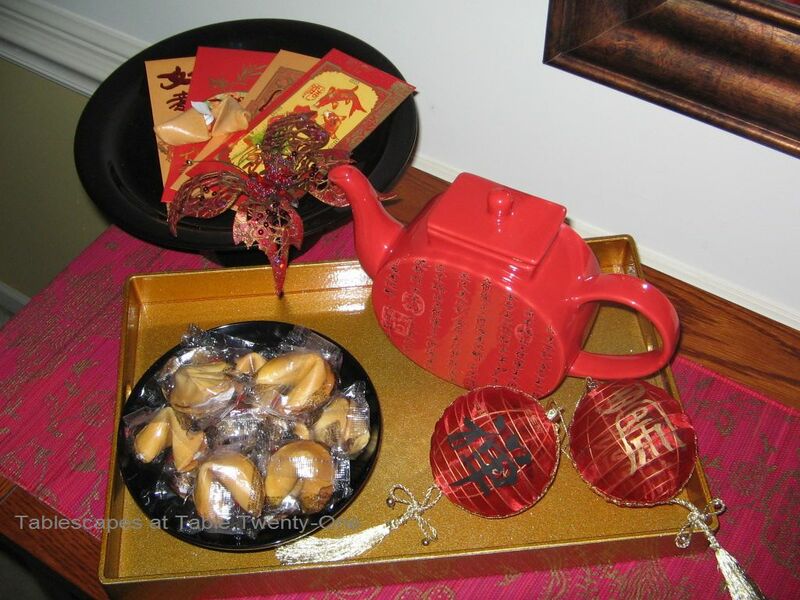 A gold tray, also from Pier 1, holds a World Market teapot and a bowl of fortune cookies. Tradition has it that parents gift their children with brightly colored envelopes with money. For my guests, however, the envelopes contained a gift certificate to World Market. Firecrackers are a big part of the Chinese New Year celebration. Lee’s Summit city ordinance prohibits the use of firecrackers within city limits (AND it was WAY too cold out! ), so these English crackers were a fine indoor substitute! I bought them at the end of the Christmas season at…where else?…Pier 1. The red & gold colors made them perfect for this event! I found this graceful young lady at TJ Maxx. 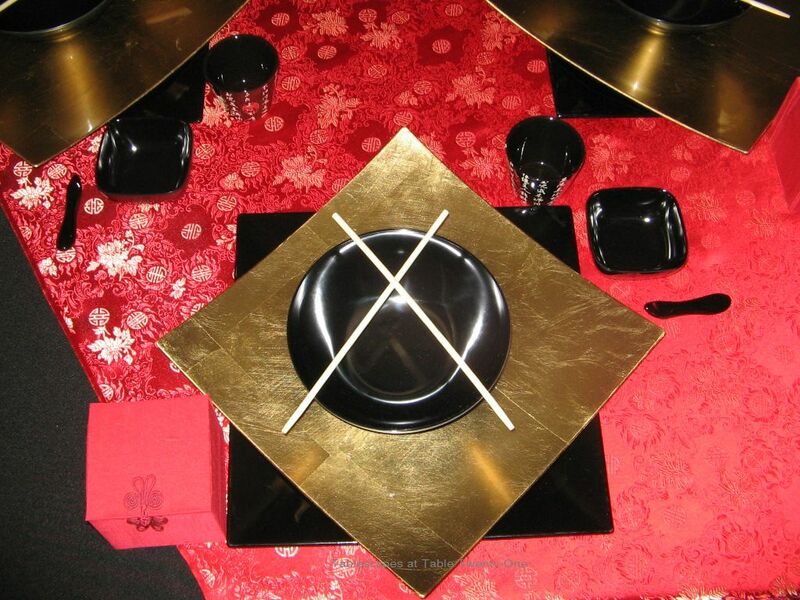 Behind her to add depth and height to the vignette are a pair of oversized decorative chopsticks and a simple gold platter on a black stand. My Mother brought these silk Chinese lanterns back from China when she visited in 2000. They symbolize the Chinese New Year Festival of Lanterns that is traditionally held on the 15th day of the first month of the Lunar Year. I am once again joining Susan at Between Naps on the Porch for Tablescape Thursday. After checking out my post, be sure to bop on over to see what the other tablescapers from around this great world of ours are up to this week! Great job on that table and an even bigger high five for the brocade sewing masterpiece. I think you can very confidently change that “D” to an “A” with this accomplishment! Your tables are always so perfectly done to stick with your theme. I LOVE that about them. Great job as always! How pretty this is. A wonderful cloth you’ve sewn for your table and I love your arrangement of chopsticks. What a great “red envelope” gift for your guests. We did similar posts again! Check out Chinese New Year – Atlanta Style on my post. I do envy that figure, though. It IS a good thing we can’t shop together. There would be a lot of pushing and maybe even some crying!!! Oh, how wonderful–I directed Mulan last year and did the set design. 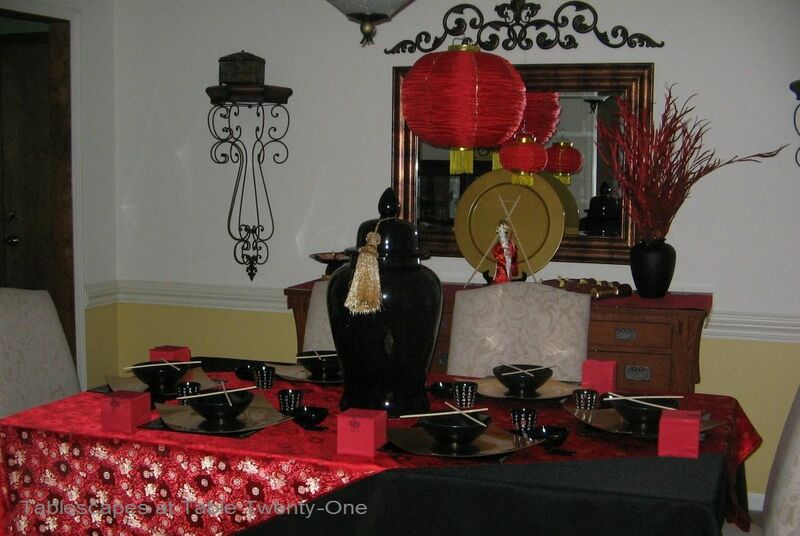 We also had a fabulous Chinese New Year party for the cast/crew…..your table reminds me of that great time! How vivid everything is–truly splendid! You sewed!!!! Congratulations. I think I love your tablecloth the best because you made it. 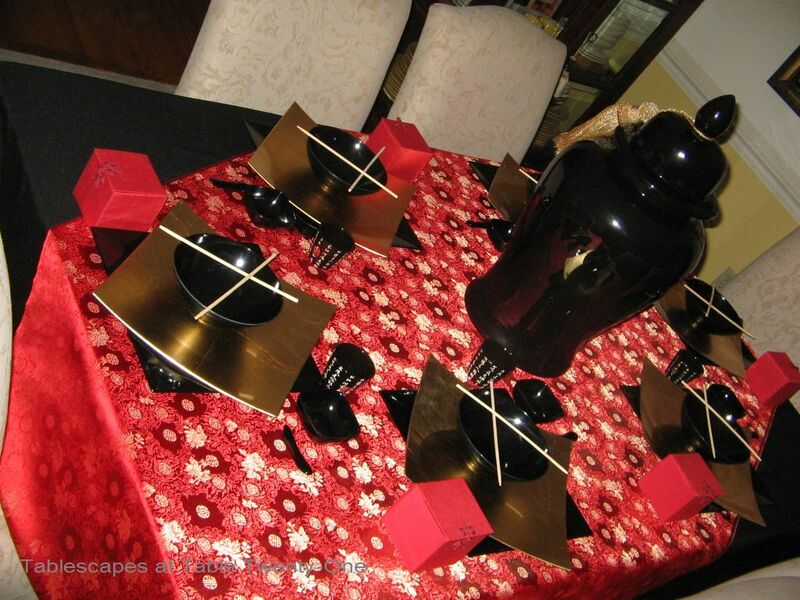 It’s perfect with your beautiful Chinese New Year’s table. You are so artistic.. don’t you have a book on this stuff yet?? I smiled at your Oprah arm comment, because I always think of her when I look at my arms in the mirror. I am a hopeless case! ;-) I think if Oprah can deal with it, so can I. I remember she talked about a surgery that can be done to remedy the situation but she said she would not do that. We have the raspberry chocolate wine chilled, in cordial glasses. It is rich, but has a finish like a wonderful raspberry chocolate dessert. Hi my friend! Alycia, your tablecloth turned out just great. It just tied everything together so well, and the fabric is amazing. There are so many elements that I love about this, the red and black, the modern, contemporary flair, and I just love that figurine with the chopsticks and plate behind it. Also, those fiery flowers, what are they called again?, anyway, how perfect! I think it’s pretty cool how you can come up with so many different ideas, I get stuck in a rut, but girl, you nailed this one for sure! Awesome! You tackled something I would never have! Bravo!! Love the colors! Well done…do I need to say more! Fabulous!! Jing and me really like the idea you displayed with your table art placement. May be one day you can publish all of your idea in a book. Hey, Mona! I was trying to not be terribly prosaic. There was nowhere a rabbit really would have fit in. No matter how I tried, it looked like Easter! Now, next year is the year of the dragon. THAT can definitely find a place somewhere! Have a warm and sunny weekend! 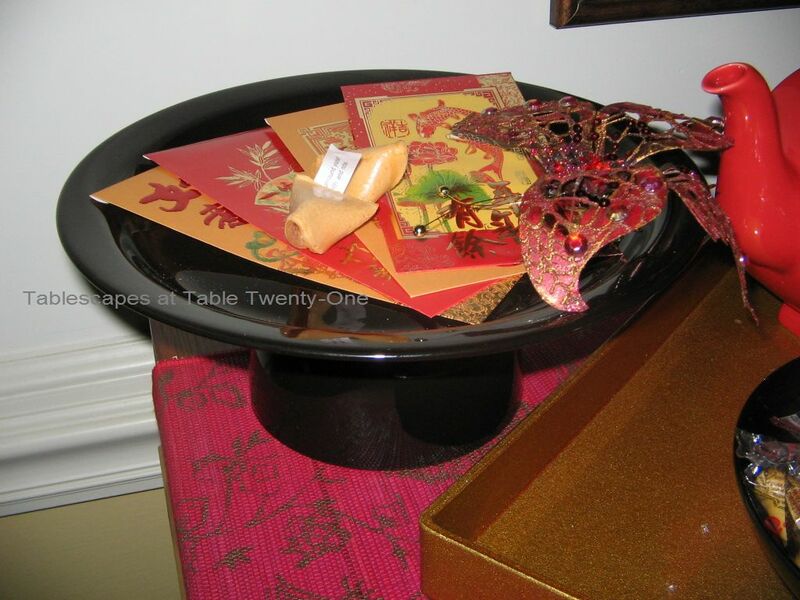 Your Chinese New Year tablescape is so colorful and creative! That was clever thinking to substitute the English crackers for real firecrackers (the crackers always look so decorative). I’m with the other ladies — hats off to you for sewing the tablecloth. I sewed my son’s merit badges on in scouting and I can sew buttons back onto clothing, but that’s about the extent of my talent in that area. I also checked out your recipe site, and those look really tasty! I’ll keep checking that for updates. Thank you again for your kind comments on my tablescape yesterday. I had fun doing it! Also, I hooted when I read your comment about the bobeches; my Mom had just asked me earlier that day what bobeches were.